New players only. Wagering occurs from real balance first. 50x wagering the bonus, contribution may vary per game. Available on selected games only. The wagering requirement is calculated on bonus bets only. Bonus is valid for 30 Days from issue. Max conversion: 5 times the bonus amount. Plena Kondiĉoj aplikiĝas. You don’t have to download the software to play your favorite games now. All you need to do is register with our online casino and play the game without installing it. Strictly Cash Casino is a leading online casino which provides the best live dealer games such as multi-player live roulette, blackjack and many more live game versions. 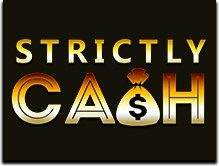 Vi povas register for free at Strictly Cash Casino and win a great 100% welcome bonus up to £/$/€200. Hurry up register now! there are many other whopping promotional offers such as game of the day, game of the day, spin the slots and many others that will keep you going.